This is the granny square we will be using for the Christmas Granny Afghan. 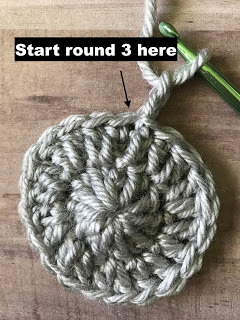 It’s a basic solid granny square with a circle in the middle. Written pattern with photos and video tutorial is below. Go back to main page of CAL here. Square measures 7in x 7in. 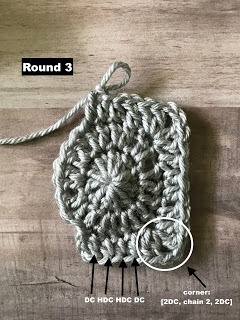 When counting edges, do not count that Chain 2 in the beginning of the round – it does not count as a stitch. If you are unable to access the video below, you may need to disable your ad-blocker. Or you may view the video tutorial here on YouTube. 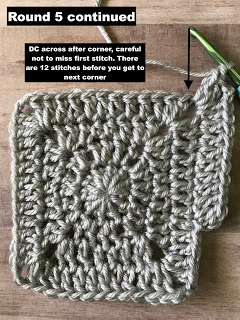 A question you may have is – to block or not to block the squares? I would say it’s a personal preference. I personally do not block my squares and once I join them together, they usually all lay together well. If anything, I may block the border once the afghan is all finished. 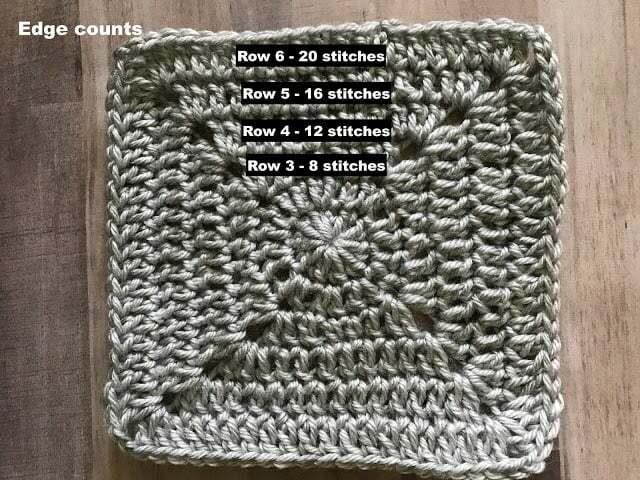 Why would you want to block your squares? People will block their squares in order to keep the shape of the square before they join them together. 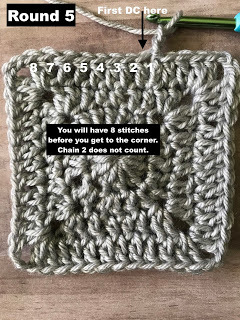 It may also allow your squares to be all the same size if you have different tensions throughout making your squares. 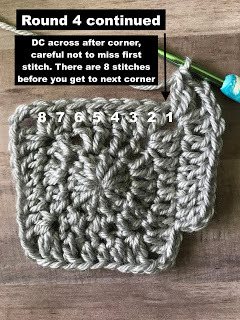 If you’d like to block your squares, there are many tutorials out there to do so. My suggestion would be to get something similar to a blocking mat (which is very similar to a child’s foam puzzle pieces play may if you’re familiar or a knee pad used for gardening) and use 4 thin dowels to pierce into the foam – place them so the distance between them is the size of what the square should be. 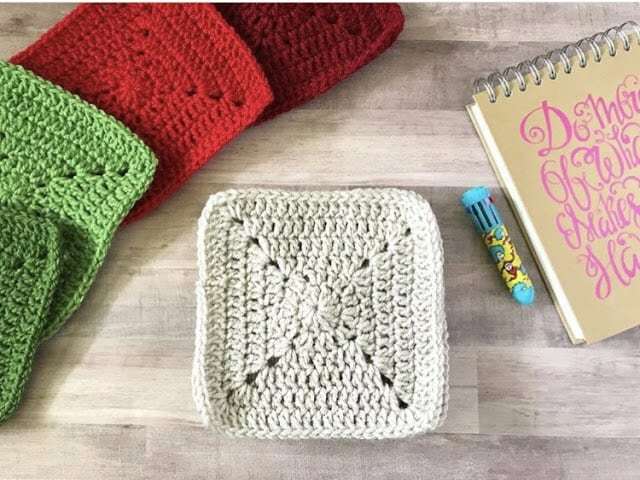 You can them slide the granny squares onto the dowels to keep their shape. 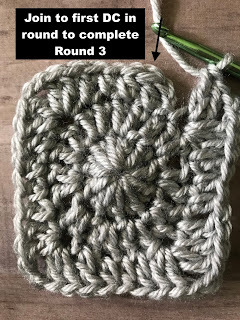 Running behind on the patterns, as today just started my 1st granny square. 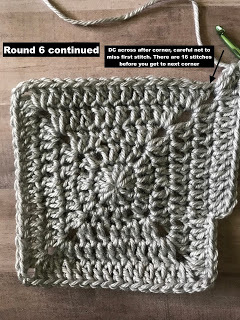 The pattern says it should be 7x7in. Mine is almost 6.5in. 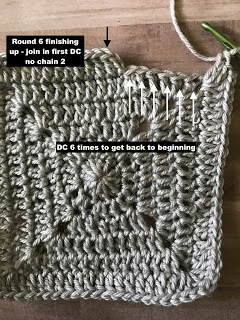 Are you doing anything different or has anything been altered in the pattern since starting the blanket? 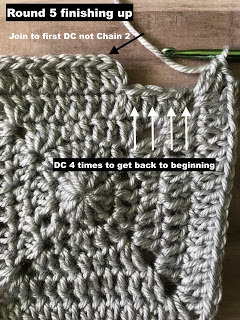 I do crochet a little tight but with the "I" hook it's helping keep me a little loose. Hi Jessie! 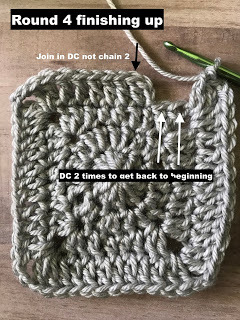 The pattern hasn't been changed since we started the crochet along. 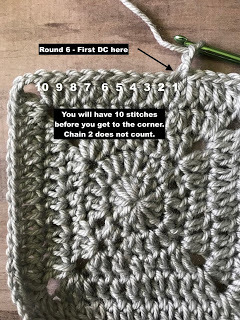 I tend to crochet loosely so my squares were 7in with an I hook. 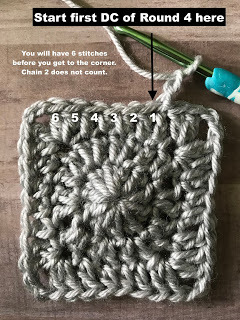 If you'd like, you can go up a hook size and that may bring your squares up to 7in. It's not 100% necessary but with 6.5 in squares you finished afghan will come out a tad smaller. It would be 54"x54" instead of 58"x58"
Hi Mary! Use the linen/light gray color to sew them together as all the colors will be touching a linen/light gray square. It is okay if your squares are 8in". You afghan will come out slightly larger about – 64" x 64"
Thank you my square measure 7" that was a typo. Now I'm stuck how sew th Santa, etc on square and I had get light gray as I went 3 store there wasn't anything lighter.